You can also visit the Political Report’s portal into criminal justice in the 2019 elections. North Carolina indefinitely revokes the driver’s licenses of people who fail to pay court fees and traffic fines. The state does not take into account one’s financial ability, nor does it typically provide notice of alternatives. A new paper by Brandon Garrett and William Crozier of the Duke University School of Law finds that more than 1.2 million North Carolinians have lost their licenses for “non-driving related reasons” such as not paying fees and fines. Their paper also documents racial disparities in these revocations. “Poverty functions differently for whites than it does for blacks,” they write. This finding is in line with studies that show that fines and fees—and their outsize consequences—are disproportionately imposed on African Americans. Losing one’s license can trigger further economic hardships and mounting legal if not carceral problems, most notably for people who keep on driving after losing their license since they would otherwise be unable to go to work or simply move about. This is true everywhere, and all the more so in areas with poor public transit. In North Carolina, the latter is aggravated by significant legislative cuts to transit funding, and by the behavior of wealthy actors like Duke University, which just sank a light rail project that was long in the works. One North Carolinian who asked to be relieved from fees he could not afford wrote in his lawsuit that the loss of his license meant that he would “have to forgo the truck driving training school, and job placement,” or else “illegally drive and risk violating his supervised release and going back to prison.” A judge dismissed the case in March. Another case still stands. Johnson v. Jessup, a class-action lawsuit, went to trial in March. Durham is taking action this year through its Second Chance Driving Project, an initiative supported by the Durham Expunction and Restoration Program (DEAR), local officials, and organizations such as the North Carolina Justice Center. Sarah Willets’s feature in Indy Week details the program’s “unprecedented scale.” Durham County District Attorney Satana Deberry has cleared tens of thousands of traffic cases this year, and she has separately asked courts to clear thousands of fines and fees that are more than two years old. Parts of this initiative were launched under Deberry’s predecessor, Roger Echols. The program will result in thousands of county residents regaining their eligibility to have a license, though informing them of this is yet another challenge. Willets writes that DEAR hopes its initiative will be a model for other jurisdictions. States can also altogether end the practice of revoking licenses due to nonpayment of fines and fees. Mississippi began doing this in 2017, and Maine followed suit last year. In Illinois and Montana, bills that would restrict the practice have each advanced one legislative chamber. Willets found no active effort to do this in North Carolina as of March. Even in the absence of legislation, initiatives to expand public transit—when done with an eye toward equity goals—can assist the housing, employment, and legal outlook of people whose ability to drive has been restricted. They can also help all people move across their region. Poor transportation, whether it stems from difficulties in acquiring a car or accessing transit, can harm the reentry of people who are involved in the criminal legal system, independently of whether they are eligible to have a driver’s license. This showcases the pernicious nature of ideas like a New York proposal to ban people from using the subway for life if they have been convicted of certain offenses. Durham seemed on its way to improving this aspect of the problem as well with its light rail project. Local officials had agreed to increase county funding after the state budget was cut, and they talked about linking people to jobs and housing; advocates were demanding additional access to affordable housing and jobs. But Duke’s announcement cut these conversations short and fatally wounded the project. Residents held protests against Duke this week. Such failures to expand public transit, as well as failures to design projects in ways that improve equality, are missed opportunities to help disentangle people from the criminal legal system’s cycle of penalties. A full version of this article is available here. Allegheny County’s longtime District Attorney Stephen Zappala will face Turahn Jenkins, the county’s former chief public defender who also worked as an assistant DA, in the May 21 Democratic primary. This is Zappala’s first contested election since 1999. The Political Report talked to Jenkins on Monday about how he would reform the county’s system. The Appeal has repeatedly reported on racial disparities in the county’s prosecutorial practices. In the interview, Jenkins evoked an array of charging and sentencing practices he favors changing: He opposes the death penalty, favors repealing rules that provide for some minors’ automatic treatment as adults, blames “this mass incarceration crisis” in part on harsh policies advocated by the state’s prosecutors association, and favors shortening the length of probations. He said he believed that “nuisance and poverty-related crimes” should be “directly diverted,” but he declined to state that he would “not … prosecute certain offenses,” as other prosecutors have recently done. He also said he would file homicide charges in the wake of overdoses, a practice to which Zappala has turned in response to opioid deaths, though only in some circumstances. Below is a lightly edited excerpt. You can read the full interview with Jenkins here. Philadelphia DA Larry Krasner recently withdrew his office from the Pennsylvania District Attorneys Association. If you become DA, would you keep your own office part the association? My feeling about the District Attorneys Association is that a lot of their practices and policies are part of the reason why we are facing this mass incarceration crisis. They were huge proponents of mandatory minimum drug laws that brought thousands of Pennsylvanians into the state department of corrections. Their policies are not in line with my views on how the district attorney’s office should operate. I think we need to shift our efforts to restoring people, not punishing them, and I believe that people should be given the opportunity to get their lives back on track. Most criminal cases are disposed of with a plea arraignment. While the DA cannot officially set the sentence, the office is typically given a great deal of deference in the process. What are some efforts you would undertake as district attorney to help curb the imposition of excessive sentences? I think we should put caps on probation. Statistics show us that if [people] don’t recidivate within 15 months of probation, chances are they aren’t going to recidivate, so why are we having people on probation for five, six, seven, and in some cases up to 10 years? The problem with having people on probation for so long is that there are fines and costs associated with probation. A lot of these people don’t have money, so they are subject to sanctions and jail time. What I did when I was a public defender was when a person was on probation and a law-abiding citizen with just fines and costs to pay, we petitioned the court to get them off probation. … [Probation officers] need to focus on people who are actually dangerous. These are people who are gainfully employed, paid their debt to society and are not engaged in criminal activity, so why are continuing to monitor them? You can read the rest of the interview, including Jenkins’s views on probation, opioid deaths, and police investigations, here. The legislation overhauls discovery rules. Right now, prosecutors can withhold files from the defense until the trial, not even providing them before defendants take a plea deal. The new rules require that they provide information (such as grand jury testimonies or visual reproductions) within 15 days of arraignment. It also reforms the bail system: It ends the use of cash bail for misdemeanors and some felonies, and provides new mechanisms for release on nonmonetary conditions. According to Governor Andrew Cuomo, “90 percent of the people who are charged will remain out of jail” after implementation. But unlike earlier proposals, the bill keeps cash bail for higher-level offenses. This falls short of many advocates’ demand that pretrial release not be tied to one’s ability to make a payment. Another reform folded into the budget is the One Day to Protect New Yorkers Act, which will shield noncitizens convicted of some class A misdemeanors from deportation by cutting the maximum jail sentence by one day (from 365 to 364 days). Colorado and Utah adopted this same reform last week. Cuomo is expected to sign the budget. New Mexico has adopted a new “Ban the Box” law that bars private employers from asking job applicants about prior arrests or convictions on an initial application. But employers can inquire into this past and take it into account at later stages. A similar bill died in Arizona. The Senate passed it in March, but Republican Representative John Allen refused to take it up in the committee he leads. Colorado’s bill abolishing the death penalty failed. It lacked sufficient support in the Democratic-run Senate. One Democrat who opposes abolition is Senator Rhonda Fields, whose son was murdered by two people now on death row; the bill’s sponsors did not answer my questions as to which other senators opposed abolition. 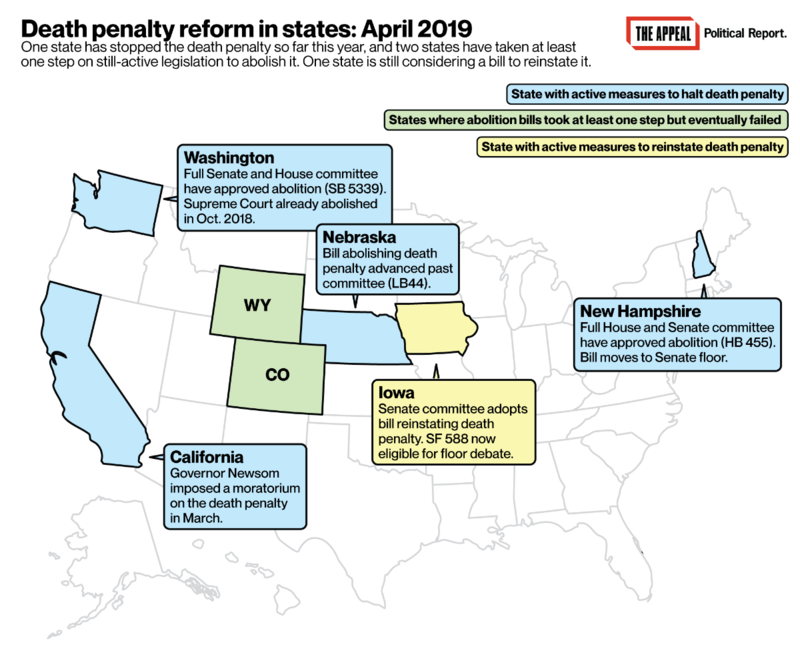 Death penalty abolition is in motion in New Hampshire and Washington, however. In both, legislation cleared a committee this week after already being adopted by the other chamber last month. In addition, abolition moved past the committee stage in Nebraska. Legislation to restrict felony disenfranchisement by enfranchising people once they are released from prison died in New Mexico in March when Democratic leaders did not bring the bill to a vote by the session’s deadline. Similar legislation also died in Washington, another Democratic-run state, where the Senate Rules Committee did not advance it. Pastors from the North Carolina Council of Churches rallied in Raleigh to demand that the state expand Medicaid. They framed this as crucial to fighting the opioid crisis by shifting away from a law enforcement response to addiction and enabling access to treatment. The GOP-run legislature has opposed Medicaid expansion. It is now mulling a more punitive response to opioids via House Bill 212, which would significantly increase sentences for people who break into a pharmacy. You can visit our legislative roundup page for more on legislative developments.